Will Coleman, product lead for Microsoft UK, says that Windows Phone models already support Near-Field Communications, the short range radio system commonly known by it's initials NFC. Coleman says that as far as he knows, the technology is in the software but just needs to be enabled by each individual phone manufacturer. 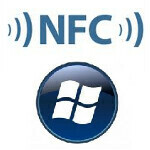 So far, no Windows Phone model has NFC service enabled on the handset. Keith Varty, the head of Nokia apps, confirms Coleman's comments and basically said that it will be coming to Nokia's Windows Phone lineup. However, Nokia wants the service to offer a secure payment system and Varty pointed out that with many other phone manufacturers offering NFC enabled handsets, those who offer a safer and secure system will be able to use that to their advantage when it comes to promoting phones supporting NFC. As we recently reported, there are rumors that Microsoft might bring "squirting" back to Windows Phone models. Early models of the Microsoft Zune offered this technique which shared songs between a Zune and another device. There is talk that the Tango update for Windows Phone models might bring the NFC technology to handsets using Microsoft's mobile OS. If this helps bring back squirting, it will help Windows Phone models catch up with Android 4.0 which already is designed to allow two similarly NFC enabled phones to share information. Other uses of NFC technology include making wireless payments from your phone, getting information off signs and displays, pairing up with Bluetooth accessories and getting information from location tags.